Peterside made this known while addressing protesting Dockworkers from the ENL Terminal at the NIMASA headquarters in Lagos on Friday. A statement by the Head, Public Relations of NIMASA, Hajia Lami Tumaka, said while briefing the director general on the reasons for their protest, the spokesman of the workers, Mr Lekan Afolabi said that they had been working at the ENL terminal for the past 10 years without appointment letters. He said they were only recently issued the letters after they made their grievances known to the ENL Management. He also appealed to the director general to intervene on the issue of their terminal benefits in order to avoid chaos in the Ports. Peterside thanked the dockworkers for being orderly and peaceful in their demands. He said that since the Agency regulates maritime labour practices in the country, he would do everything legal within his powers to ensure that their grievances were adequately addressed. “A labourer is worthy of his rewards, in this regard we shall ensure that no dockworker in all the Seaports in Nigeria is short-changed,” the NIMASA DG said. 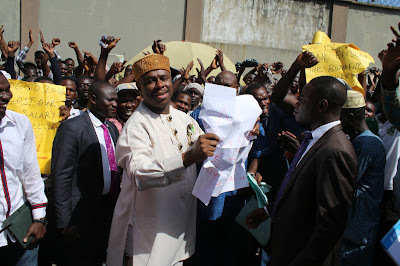 Peterside charged the dockworkers to continue to be law abiding while the Agency tries to resolve the dispute through a tripartite meeting with the leadership of the Maritime Workers Union of Nigeria, ENL Management and NIMASA. Worthy of note, is that NIMASA is responsible for the welfare of Dockworkers and Seafarers in line with the International Labour Organisation (ILO) Decent Work Agenda and the MLC 2006 Convention which Nigeria recently ratified.